2017 hasn't been a very good year for penny stock shell manufacturer and salesman, and attorney to the pump and dump stars, Adam Tracy. Although he is accustomed to having to explain his actions in court, this could be the year that the proverbial hammer finally comes down on Tracy's head. Two concurrent actions may bring about his retirement from the legal profession, either voluntarily or not. I presume that the prospect of possibly being disbarred, as embarassing as it would be for a reputable attorney, doesn't bother Tracy. I suspect that the lion's share of his income comes from penny stock schemes, such as the one described below. Last week, Tracy's motion to dismiss an action brought by THC Therapeutic's, Harvey Romanek, was denied by a Nevada District Court Judge for lack of merit. In other words, Romanek's case has teeth. The litigation was begat by Romanek's purchase of the old GOFF shell from Tracy and his partners in schemes. For those of you who are new to the penny stock sham game, or have poor memories, GOFF was an Awesome Penny Stocks (APS) pump and dump scheme during the spring of 2013. APS was a prolific spam email promoter, purportedly with over 700,000 email addresses, just enough to create some of the biggest scams the stock market has ever seen. Quiet simply, APS was the best at being bad, creating hundreds of millions of dollars in losses through the hyping of several worthless tickers, including GOFF. As was normally the case with APS pumps, GOFF was abandoned once the insiders sold all their stock during the promotion. The company stopped filing concocted financials and disclosures and ceased issuing just as phony press releases. It took much longer to manufacture the scheme, than it did to profit by and then end it. Enter Adam Tracy. One of Tracy's business models is to pick up these abandoned shells and resell them to clients who come to him, looking for options to become public through reverse merger. I have always maintained that this is a lousy way to go public, both for a (legitimate) company and especially for prospective investors. The company can face a myriad of unknowns which can affect the well being of the company and/or the trading of their stock; for example, undisclosed debt holders and nefariously intended established shareholders. This was indeed the case with GOFF, as I will discuss later. For potential investors, there is none of the regulatory oversight, even if it is minimal at times, that comes with a filing for a new public issuer. In other words, any two-bit, assetless, do nothing company (the common characteristics of companies who choose to go public in this way) can instantly become publicly traded through a reverse takeover transaction. Much more often than not, the public entity will eventually again become an empty shell, ready for the next scheme that will again expose the public to losses. I have long been an advocate for ending reverse takeovers and requiring companies to go public through the regulatory approval process with a qualifying and provable asset. For some reason beyond understanding, trading in an abandoned company such as GOFF does not get suspended unless the SEC finds overwhelming evidence of shenanigans, and often not even then. Shell peddlers like Adam Tracy gain custodianship of abandoned public companies by purchasing a couple of dollars worth of stock, and then using the status as a shareholder to seek custodianship of the company through the courts. Since it is likely that no other party will come forth and contest the application for custodianship, the court almost always grants it. The entire process can take as little as a month. Typically, the newly minted custodian will then make himself (or his nominee) the lone officer/director, reverse split out the established shareholders and then award himself enough shares to give him defacto control, usually through a series of concocted debt that suddenly appears on the books. Old debts and assets will disappear on fresh financials disclosed to OTC Markets Group. Gaining custodianship requires a number of subsequent actions by the applying party, among them, an attempt to notifiy the listed officers and directors of the company at issue and the calling of a meeting of the shareholders. In the case of GOFF, Tracy and his cohorts did not comply with any of the requirements before attempting to sell the GOFF shell, including the requirement that the ongoing SEC investigation of the actions of Adam Tracy be disclosed. More about that later. The agreement to sell the GOFF shell to Romanek was reached before Tracy's group was even awarded custodianship. Initially unbeknowst to him, Romanek was footing the bill for the costs of the custodian application. At the end of the day, Tracy and company constructed the deal to be a takeover of Romanek's company by GOFF, not a reverse takeover of GOFF by Romanek, under the terms originally agreed to by the parties and the onus of Romanek's lawsuit. Furthermore, Tracy never executed the agreed upon reverse split, leaving hundreds of millions of shares on the street that were sure to be dumped once aggressive trading resumed. Had Romanek stood still for the intended fleecing of his company, Tracy et al. would have been left with a pocketful of GOFF stock, likey to be divested in a future promotion campaign, and probably the reason that Tracy didn't execute the agreed upon reverse split. Liquidity in the stock would make for more trading volume and an easier task of dumping the ill-gotten shares. As I alluded to earlier, and recently revealed to Romanek, Tracy had also neglected to inform him of a judgment I hold against GOFF in excess of $57,000. While Tracy may not have known of this judgment at the time he made the deal to sell the shell to Romanek or at the commencement of the application for custodianship, he certainly knew of it by July of 2016 when I first contacted him. My reaching out to Adam Tracy was percipitated by the sudden trading in GOFF shares, at which time I perused the OTC Markets profile page for GOFF and noted that Tracy was listed as the only officer and director. Even more interesting was that a link to THC Therapeutics' website was displayed on the page in an obvious and successful attempt to stoke interest in shares. Indeed, shares climbed as much as 750% after the pending acqusition was teased. One must wonder, perhaps tongue-in-cheek, whether Tracy and company benefitted by this surge in the share price. Adam Tracy's communications with me regarding my judgment against GOFF, also show him to be the coniving liar and cheat that those who follow the penny stock game expect that he is. Throughout our communications, I was assured by Tracy that I would receive consideration for my judgment upon the closing of the sale. Of course by then, Romanek had already long paid for the GOFF shell. Eventually, Tracy went so far as to ask me for a copy of my judgment, which I immediately forwarded to him, thinking that my debt was about to be settled. I had already checked the Nevada Secretary of State's website and had seen that on July 26, 2016, by which time Adam Tracy had been informed of my judgment, a new list of GOFF officers was filed. On Decemeber 28, 2016, after I had sent numerous emails requesting an update, Adam Tracy finally responded. He claimed that the party that was to purchase the GOFF shell had backed out. Of course this was a lie, as Romanek had already paid for the shell and had been installed as the officer and director. Unbelievably, Tracy is advising me to go ahead and attempt to gain custodianship of GOFF after he has already sold it! I let Tracy dig himself a deeper hole in follow up emails such as this one. The GOFF action could and should be brought to the attention of the Illinois State Bar. Considering Adam Tracy's egregious actions, if Romanek or his attorney don't file a complaint, the Judge in the civil action very well could. Not only did Tracy misrepresent his client's best interests, but he and his crew failed to follow the requirements of custodianship, thereby making a mockery of the court. In the meantime, I am now taking my own action against Tracy in response to his lies to me. Any new disciplinary action by the State Bar, would not be the first that Tracy has faced. Tracy is fighting a war on two fronts, as he is currently scheduled to face the Illinois Attorney Registration and Disciplinary Commission on October 3rd for a series of alleged failures to adequately represent a number of clients, including taking money for services not rendered and acting dishonestly. As this action was launched in February of this year, Tracy may have had a duty to inform the court of this pending hearing during the custodian application process, as well as to his clients, including Romanek. Within his complaint, Romanek states that he was unaware of the bar's course of action. In the past, the parties had been negotiating settlement to no avail. In light of the court's denial of the motion to dismiss and his troubles with the state bar, I would expect that Adam Tracy will soon be more receptive to meeting Harvey Romanek's terms. I hope that Mr. Romanek will see this lawsuit through to its conclusion (I expect that his counsel will file a Motion for Summary Judgment at some point), so that Tracy will be forced to face the music. The ultimate goal should be to increase public safety which can be achieved through the removal of Adam Tracy from the markets. Romanek's THC Thereputics was eventually rolled into another very dirty shell, formerly ASUV, now trading as THCT. ASUV's reputation was damaged by a series of pump and dump campaigns over a two year period from 2012 to 2014. As I've stated before, I am not fond of this method of going public, but I'll wish Mr. Romanek luck, provided that I do not see any future pump and dump campaigns on his stock. Hopefully, those involved in the sale of the shell, did not retain any stock for themselves and future funding will not come from toxic funders whose only intent is to mercilessly dump stock. 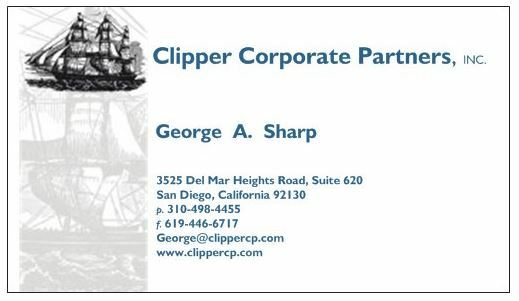 I've informed Mr. Romanek that I would be happy to investigate and report on the history of any proposed funders, a service that Clipper Corporate Partners (CCP) provides, with the intent to minimize risk to the reputation of the company and retail investors. CCP also offers a forensic research service to those considering the acquisition of a shell for the purpose of a reverse merger, while seeking to avoid the problems that Mr. Romanek experienced with the failed acquisition of the GOFF shell.